With tributes to the community of Knaresborough and unveiling of plans for the year the chain has been passed, and a new mayor declared. Knaresborough House was filled with representatives from across the district, both past and present last Thursday for the town’s Mayor-making ceremony. The night saw awards handed out to recognise contributions to the town prior to Coun David Goode’s departure as Mayor, rounding off a year marking the importance of volunteers to Knaresborough. Coun Phil Ireland was named as the new Mayor, and has served as a town councillor for the past seven years. He currently also holds for a second time the position of Cabinet Member for Sustainable Transport at Harrogate Borough Council (HBC). In his first address as Mayor, after paying tribute to his predecessor and the former Mayor’s Consort, Catherine Goode, Coun Ireland said he hoped to see the council work together on projects including the delivery of a Performance Pavilion for the town. He said:“I am passionate about Knaresborough, and improving the lives of residents, and this year I have some ambitious targets I hope we can achieve as a council. “I think we can achieve these by working together, cross-party and in partnership with HBC to deliver projects such as the Performance Pavilion, Castle Illumination and bringing back empty shops into use to improve the economy. Whilst chairing the Knaresborough Market Working Group Coun Ireland outside of his council roles has previously volunteered as Governor of Aspin Park Academy and the Forest School. He currently is a Stakeholder Governor at the Harrogate and District NHS Foundation Trust. The night saw his wife, Sheena Ireland, named as Consort, while Tim Hunter was named as Deputy Mayor, and Jennifer Hunter as Deputy Consort. They follow last year’s Lynda and Tony Powell. 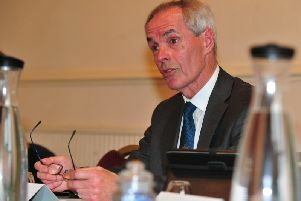 Coun Goode’s year as Mayor saw him involved in projects ranging from the Knaresborough Neighbourhood Development Plan, the Knaresborough Market Working Group and the Knaresborough Business Improvement District. His Year of the Volunteer push also saw him establish a new funding pot, open to individual volunteers to pay for training. Raising £1,200 for this he hopes it will be the initial start for an ongoing fund for the town. He will continue to serve as a Town Councillor and although looking forward to a few weeks rest he said there was still much work to be done. Coun Goode said: “In terms of what brings most meaning to me having been Mayor is the level of commitment from volunteers throughout the town. In many respects this town would not function without the number of volunteers who work with the elderly, with children, to improve the environment of the town and do a wonderful job. In recognition of work carried out for the town during his term Coun Goode gave out a number of tributes and awards, including the Community Cup to Bernard Higgins. This was to thank Mr Higgins’ efforts to promote John Metcalf as a major figure in the town’s history this year, alongside attempts to have the road and pavement around St John’s Church reinstated. Jo Smalley, of the Friends of Jacob Park, collected an award for the group’s work including the community wildlife pond project, which aimed at improving biodiversity. Past Mayoress, Sharn Oakes, was thanked for her patience to be awarded a Mayoress Badge, for her work alongside Bill Rigby in the office during 2016. Coun Goode paid tribute to them both, saying they were ‘a hard act to follow’ and hoped he lived up to their expectations, having served as their Deputy Mayor.